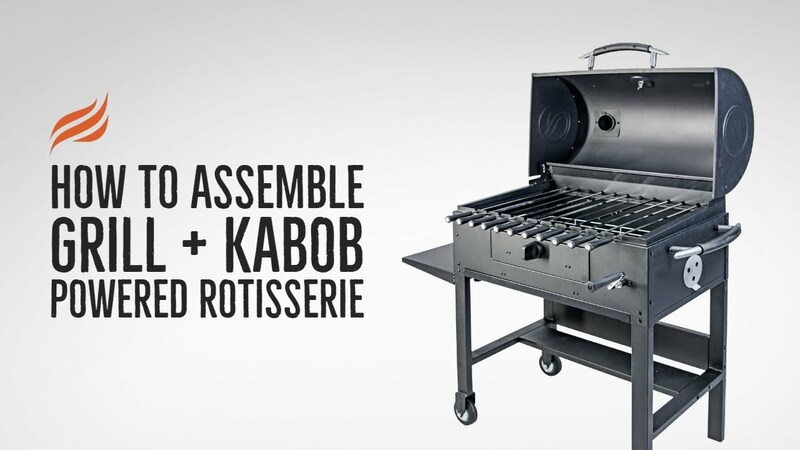 Feed the crowd with the Blackstone charcoal Rotisserie Grill+Kabob in Black with Automatic Motor! Deck out 11 delicious kabobs on 23” heavy-duty skewers with beef, fish, chicken, and veggies - if you can stab it with a skewer, you can cook it up on this automatic turning machine. Use the front crank to raise and lower the charcoal tray for more precise heat control. And if grilling’s what you’re looking for, we’ve got you covered. The Grill+Kabob comes with 3 interchangeable cast iron grill grates. Fire up the charcoal and grill fish, chicken, beef, and veggies with smoky flavor! Love this grill.I owned this Kabob for 2 years but its time for me to replace the grates, anybody knows where can I find them, please anyone help!! Love this grill.I owned this Kabob for 2 years and its time for me to replace my Grates, but cant find them any where any advise on where can I get them please, anybody knows? Haven't used the kabob feature yet but had a recent bbq and everyone grilled their own meat. Easy to control temp and love the ease of cleanup. The cast iron grills are great because you don't have issues with things falling through like wire ones! GreatThis kabob cooker works great, have not used the grill yet but sure it will work just fine. It was no problem putting it together and is a very good quality. WowNothing else like it I have found and at only $200. I've used it 3x now and love cooking the bobs I call it the Bobs Bomb! Bobs Bomb! Love it! Thanks! !